The flow chart above taken illustrate the circulation of iron oxide in the life on Earth. To begin, iron oxide in the Earth is gradually deposited into rock, forming ores. Next, ores is mined and refined to separate acid mine deposits used for sulfuric acid industry as raw material, generating dust. 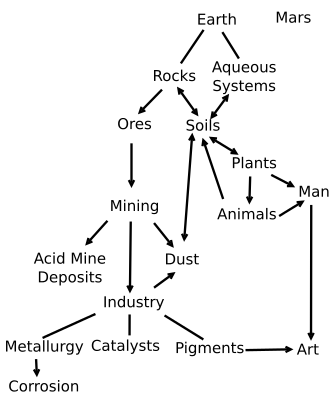 In the subsequent stage, refined iron oxide becomes important material in many industrial processes including:metallurgy( products then need treating with anti-rust protection due to corrosion), catalysts(especially magnetite use in Harber process and water-gas shift reaction) and pigments( brown, black or greenish color , used in art). The waste of the industry as well as mining is dust which may be legally treated and return to soils.